Not all poses you see on real-life models translate well onto paper, but it’s helpful to recognize different poses and understand what types of poses work well with different types of clothing. A fashion model in an evening dress doesn’t strike the same poses as a teen dude in an urban outfit. The fashion model stands tall and straight to show off the gown’s bodice and skirt; the teen dude is likely to assume a slouched pose to demonstrate how the clothing moves with ease over his body. Make sure your model isn’t leaning on anything. She should be standing on her own two feet. Keep your model from falling over on the page. You create balance by keeping the head, shoulders, hips, knees, and feet in a straight line from head to toe. Angle the shoulders in one direction and the hips in the opposite direction. 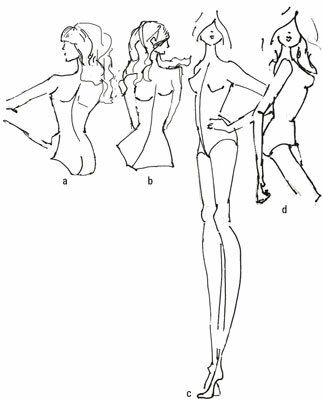 Doing so gives the impression of movement and attitude — two must-haves in fashion drawing.